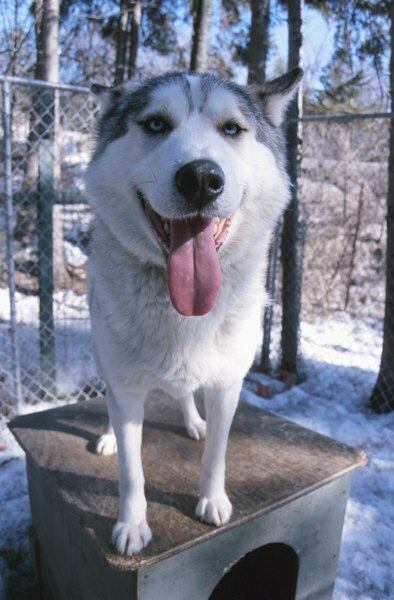 Chain-link is a durable kennel option. Dogs are territorial and building a house for multiple dogs requires a large space to provide comfort and prevent conflict. Several building options are possible and cost varies by material. Building a fence style kennel with a roof and optional fabric siding is cost effective while providing a nice space. Measure the area of your kennel and mark the corners with stakes. Base the size of the kennel on the number of dogs. Roughly 10 square feet per dog is adequate. Dig a 2-foot deep post hole at each corner of the run. Measure and mark every 6 feet along the length of the kennel walls. Dig a 2-foot deep post hole at each marking. Set a 2 3/8 inch galvanized steel post in each of the holes. Cut the posts to match the height of your chain-link plus 2 feet for the hole. Add an extra 6 inches if desired to leave room for error. Mix the quick set cement in a wheelbarrow. Pour the cement into each hole until all of the holes are full. Use a level to adjust the posts as the cement sets. Make adjustments until each post is set in a vertical position, perpendicular to the ground. Leave the posts to dry overnight. Fit a three-way coupling adapter to the top of each corner post. Fit a two-way adapter coupling to each of the interior posts. Connect the couplings with posts to form the top rail of the fence. Dig a 6-inch trench connection the outer perimeter of the kennel. Align one end of the chain-link with a corner post. Leave the door area open. Sink the bottom of the fence into the trench. Use fence ties to secure the chain to the post. Unroll the chain-link around the perimeter of the kennel. Pull it tight to each post and secure with fence ties. Also tie every 6 inches to the top rail. Continue until the entire perimeter outside of the front is covered. Measure the roof of the kennel. Cut a section of chain-link with a 1-inch overlap to fit the roof. Set and secure the roof with fence ties. Purchase a panel with a gate that fits the interior dimensions of your fence. Measure from one front corner inward, subtracting for the door panel. Mark the spot with a stake. Slide a tension band over a steel post. Slide the post through the gate hinges. Dig a 2-foot deep post hole at the marking. Set the post so it runs flush to the top rail. Pour cement and set the post in a vertical position using the level. Prop the gate on bricks to reach the desired height. Slide the tension band to the bottom of the gate hinge. Tighten the bolt with a socket wrench to secure the band and set the gate height. Cover the final space between the gate and the corner post with chain-link and secure it to the posts and top rail with fence ties. Lay out privacy slats and begin weaving them vertically into the fence. Cover the roof and sides of the kennel to create a sheltered house. Stretch a vinyl fence fabric over the roof of the fence. Use fence ties to connect the material to the top rail. Make a tie for each foot of fabric. The fabric will shed moisture and keep the floor dry. Spray water on the roof with a hose to test the fabric. The interior floor is dry when the fabric is properly installed. Allow at least two days for the fence construction. Measuring and setting the posts requires one day because the concrete must dry. Build the doghouse on a level surface. Building on a slope will skew the post height. How Big Do Labrador Dogs Get?